Goss Consultancy Limited (GCL) was established in 2005 by Nick Goss. GCL works with organisations to help them become as diverse, accessible and inclusive as possible in the way they employ people, develop policies and deliver services. We have a firm belief that achieving equality and promoting diversity is not only about legal compliance but is a key ingredient to the success of modern day organisational development. The team at GCL is made up of Consultants who have a minimum of 10 years’ experience working in equality, diversity and inclusion and are recognised subject matter experts in the field. We offer end-to-end support in devising, developing and implementing Access & Inclusion Strategies, our services include amongst others: Access Audits/Reviews, Access Design Appraisals, Disability Confidence Training, Mystery Visits/Access Focus Groups, Reasonable Adjustment Management Support, Equality Impact Assessments, and Policy, Practice and Procedure Reviews. GCL works with organisations across the public sector, private sector and local and national governments, and specifically within the arts and heritage, commercial and retail, education, sports and leisure, transport, finance and hospitality sectors. GCL has an Experience Reality Panel made up of people with different backgrounds, circumstances and with experience of a variety of impairments and health conditions. We ask our panel members, through focus groups or mystery visits, to contribute their views and perspectives on the accessibility of organisations’ service provision and discuss what really works for them – and what doesn’t – when accessing services. GCL understands that access means more than just a ramp, and that through listening to your ideas organisations and panel members together can bring about real change. We are looking to work with disabled people who can share their ideas and experiences with clients across the country to help improve their services. From museums and galleries, to shopping centres and heritage sites, there is so much you can get involved with. You could get involved with mystery shopping, focus groups, online audits and even write reports on particular sites. Panel members get remunerated for their contribution. You will also have a friendly and professional team to support you along the way. By getting involved, access can be improved for yourself and others facing similar challenges and clients gain more understanding of your needs. 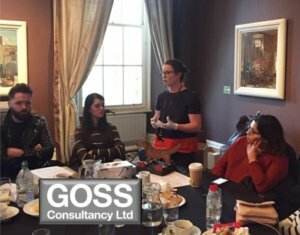 By becoming a panel member, Goss can take on board your thoughts and ideas and with your help provide leading expert advice on disability issues.